It's not often that a composer makes a material difference to his own time. 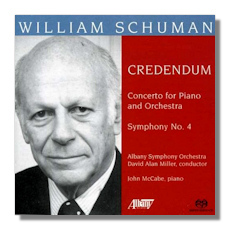 In that regard, one can argue for William Schuman (August 4, 1910 - February 15, 1992) as the most influential American musician of the Twentieth Century. Schuman began composing as a New York teenager crazy for swing bands. He created charts, wrote songs (among his lyricists, his high-school classmate Frank Loesser), and led his own groups. In 1930, an encounter with Toscanini conducting the Philharmonic turned him toward classical music, and he began to study, notably with Bernard Wagenaar and Roy Harris. In 1938, his Symphony #2 premiered and brought him high-powered attention and support, notably from Aaron Copland and, through him, the conductor Serge Koussevitzky. 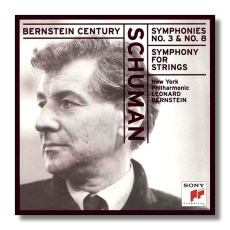 More honors came his way in the Forties, when Schuman won the first New York Music Critics Circle Award for his Third Symphony (1941) and the first Pulitzer Prize in music for A Free Song (1943). Throughout his career, he collected a bag of honorary degrees, two Guggenheim Fellowships, and memberships in both the National Institute of Arts and Letters and the American Academy of Arts and Letters. 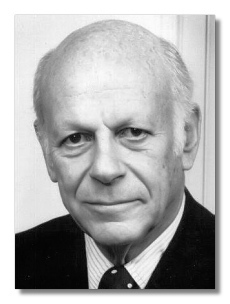 When Columbia University established the William Schuman Award – $50,000 for a composer's lifetime achievement – Schuman himself was the first recipient. If there's a prestigious award lying about, Schuman probably picked it up. Schuman also had a stellar career as teacher and administrator. He taught at Sarah Lawrence College and became the director of publications at G. Schirmer publishing house and, later, became the president of the Juilliard School. He reorganized and revitalized that institution. His notable accomplishments there include the founding of the Juilliard String Quartet – the model for resident quartets today – an overhaul of the academic curriculum, based on primary musical materials (history and analysis), and the strengthening of the composition department. He attracted such distinguished composers as William Bergsma, Peter Mennin, Vincent Persichetti, Robert Starer, and Robert Ward. In 1962, he became president of Lincoln Center and applied his penchant for innovation to a much larger canvas. He founded the Chamber Music Society and the Film Society, brought the Juilliard School within the borders of Lincoln Center, and added the Juilliard theater program, one of the country's finest training grounds for young actors. With its concert halls, opera and dramatic stages, libraries, as well as its educational mission, Lincoln Center became a synergistic nexus of American art, thanks to Schuman's vision. He left Lincoln Center in 1969 to devote himself to composition and continued to rack up honors and awards. For a large part of his old age, he suffered from a painful inherited bone disease but continued to compose. 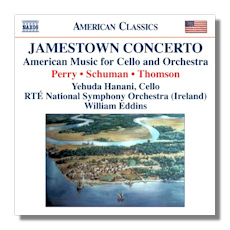 Excelling in every genre but opera (he wrote two small-scale ones), Schuman became best known for his symphonies, although he's also one of the few major American composers with an extensive choral catalogue. He withdrew his first symphony but kept the numbering of the others. So he wound up with nine symphonies, as he put it, "eccentrically labeled from two through ten." 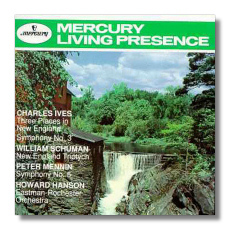 In the beginning, he approaches the symphony very much like Roy Harris, whom he had sought out as a teacher, but he quickly comes up with something personal, an idiosyncratic combination of Harris's "organic growth" with classical form. To a large extent, his music lies beyond the Stravinsky-Schoenberg dichotomy of the interwar years, and yet it feels like part of a mainstream conversation. Like most American composers of his generation, he is touched by nationalist trends, mainly in his inspirational sources. On the other hand, unlike Aaron Copland, he rarely goes to popular or folk materials and forms, nor does he try to fashion a folk-derived idiom. The music is urban in sensibility, often intellectual in its inspiration – Freud seems to play a large role – while retaining its emotional power. The music typically is flinty, acerbic, and terse, dominated by extreme dramatic contrasts, high, piercing strings, screaming winds, jumpy rhythms, and powerful percussion. Harmonically, one typically finds simultaneous clashes of major and minor thirds as well as major and minor sevenths. Given the level of activity, there are astonishingly few notes, generally speaking. Often the symphonic argument is carried on by extremely simple and limited changes.